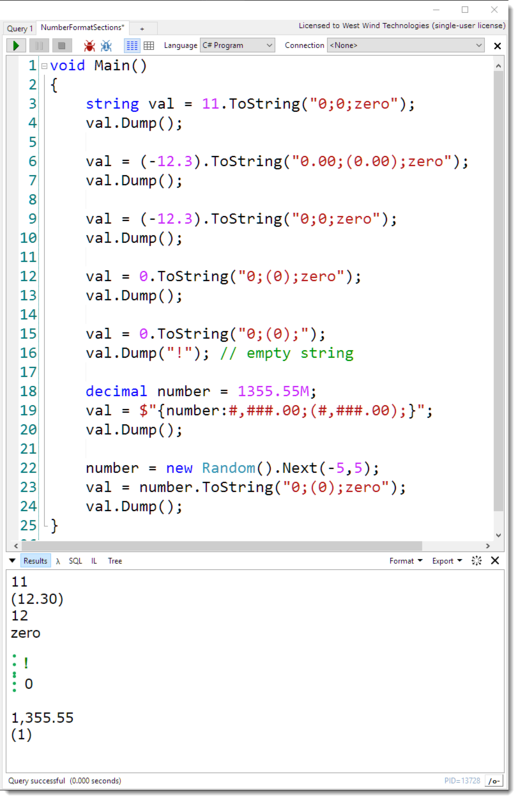 I'm not sure how I've missed this feature in all those years of working in C#: String.Format() supports Number Formatting Sections that allow you to show separate values for positive, negative and zero values. by using a single format string. The ; character acts as a separator for those three values. But be aware that the format strings you use for the sections are very different than normal format strings - you can't use things like n0 or c2 but you have to be explicit about the number format. Instead you use # or 0 to specify number in the format string and , or . to specify thousands separator and decimal point respectively. In other words, sections are a special kind of format string using its own custom format for each section. So, this obviously isn't a game changer of a feature, but it's kinda cool in terms of being able to concisely format numbers especially in scenarios where the number formatting is inlined - like in templates are things like Razor where a function is a lot nicer to read than an immediate if expression. May I know the editor you used above on name?